Gift Package Letterhead & Envelopes capture the joy of the holiday season with a truly stunning design that looks like a perfectly wrapped present. The lightly colored center is also perfect for creating messages. 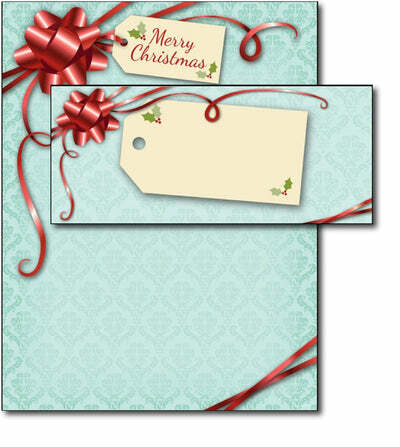 Use this stationery to send your Christmas letters or holiday invites! These Gift Package Letterhead & Envelopes are made from a 50lb Text paper stock, while being both inkjet & laser printer compatible. Each stationery sheet measures 8 1/2" x 11". The accompanying envelopes are the standard #10 size of 4 1/8" x 9 1/2" and are gummed for easy sealing.